It is said that the resident inspector job is the greatest job in the NRC. You are the front-line eyes and ears of the agency, you can clearly see the impact you provide with regard to nuclear safety, and your boss is far away on the phone! For the last 3 ½ years, I have had the chance to prove that adage true. 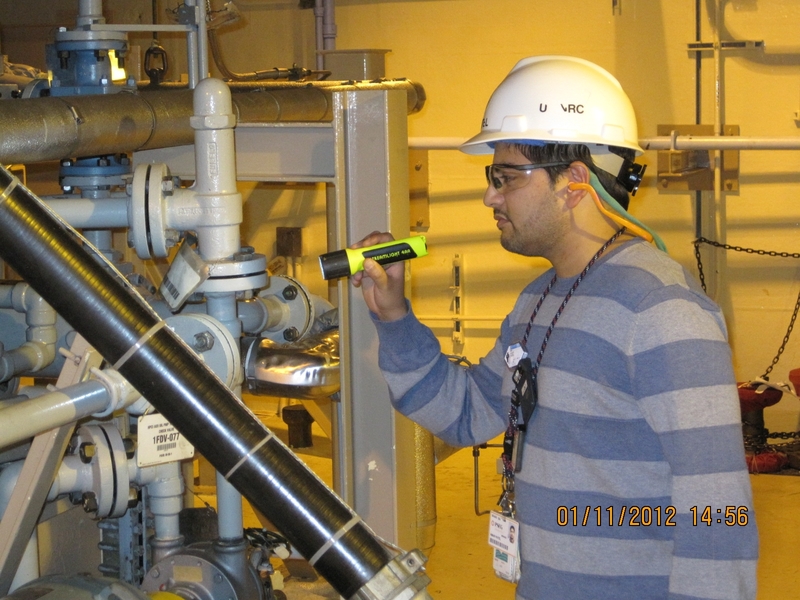 The job of a resident inspector at the Hope Creek Nuclear Plant, located in southern New Jersey next to the Salem Nuclear Station, is unique for several reasons. The site is close to a metropolitan area (Wilmington, DE), but the winding rural roads leading to the site make for a considerable drive to work. Once I reach the parking lot, it still remains quite a trek to my desk. That’s because the site is sprawling, and the pre- and post-9/11 security measures necessitate a long walk through checkpoints with armed security guards. The inherent nature of the resident inspector’s job makes for an early start. I need to provide plant status and safety information to NRC Region I management on a call that starts at 7:30 a.m. To get that information, I either visit the control room or attend a “Plan of the Day” meeting. In the control room, I speak with the licensed operators, examine their logs, and review the control room panels. After communicating with the regional office, the senior resident inspector and I discuss possible inspection activities for the day. The Reactor Oversight Process prescribes the inspections we must perform and the frequency they must be performed. However, the company’s work schedule dictates what inspection opportunities may present themselves on any given day; emergent equipment problems also adjust our priorities. The inspections selected are done considering the risk significance of the activity; if two similar activities are ongoing, I choose the activity with greater safety significance. The results of our inspection work are discussed with company management on a periodic basis — or immediately if a safety issue arises — and are documented in a publicly available inspection report on a quarterly basis. The greatest thing about the Hope Creek Resident Inspector Office is that it is co-located with the Salem Resident Inspector Office. Thus I have four other co-workers to speak with and bounce questions off of versus the usual two. I work with three inspectors and an ever-pleasant office assistant. We work well together as a team and have a high degree of camaraderie. We also have visiting specialist inspectors almost every week, which keeps us current on issues in the office and the industry. My favorite element of inspection work involves plant “walkdowns.” They allow me to see the most about the plant’s design, construction, and operation, and generate many ideas for follow-up inspection activities. They also allow me to observe workers actually performing their jobs. On rare occasions, these workers will have concerns with certain work activities and will bring them to my attention. They are handled by the NRC allegations process. My interaction with the worker is critical in making them feel comfortable in raising a concern, and reassuring them that the NRC will be responsive to their concern. Overall, the job of an NRC resident inspector is great. While I joined the NRC out of college as an engineer and received extensive training my first two years on the job, I continue to have opportunities to get top-notch training to help me do my job better or prepare me for another position in the NRC. (The NRC’s current Executive Director for Operations began his career as a resident inspector at this site.) I also have the opportunity to inspect other sites periodically, and I have a high degree of job satisfaction. And I know that every day I am working to keep the community around the plant safe. I agree with William. You have to explain to people the dangers and benefits of nuclear weapons. I think we should enlighten the public with useful information through the Internet (like this blog) and not with the nonsense that advertise on television. Sorry for my English, I’m learning English. Forgiveness. I hope I have expressed my feelings. Yeah, agree with William. It’s a very responsible and dangerous profession. Thank you very much for sharing your day-to-day work at a nuclear power plant. I am resident inspector too at Trillo nuclear power plant in Spain and I feel quite close to the comments and descriptions you made. It’s not just the greatest job, its the greatest responsibility, I don’t have guts to work in such a position. However, when I see how passionate the resident inspector about his job I feel safe. Of course most of us don’t really know what it takes be an Nuclear Power Plant Inspector. It’s good to know a day live and what is involved of such career. It helps us to gain a better appreciation for the Inspectors – for what they do for us and the country. G’luck with your continuous study Amar. I am a student and its help me a lot , nice sharing , thankyou so much.. Most people don’t realize what is required to run a nuclear power plant. This blog shed some light into the day by day operations a resident inspector must go through. I believe it is a great honor and a tremendous responsibility to be in this position due to the fact that one decision is capable of affecting millions of lives.